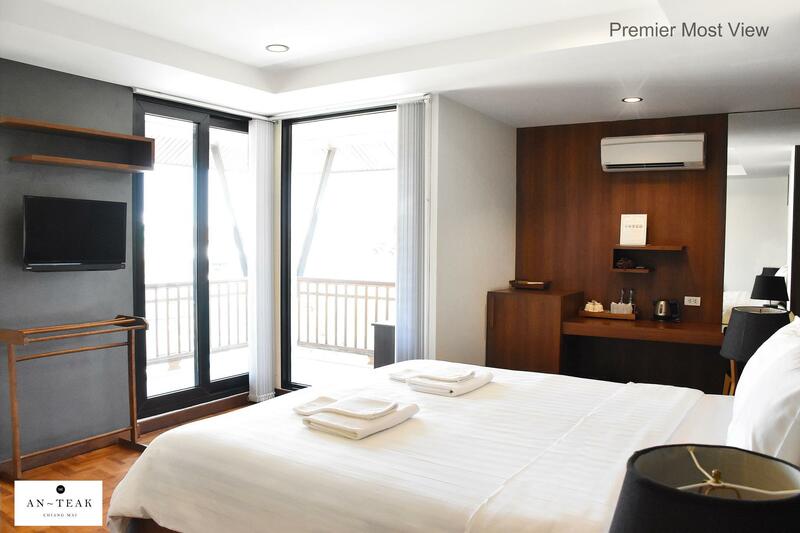 Té alguna pregunta per a The An Teak Chiang Mai Hotel? 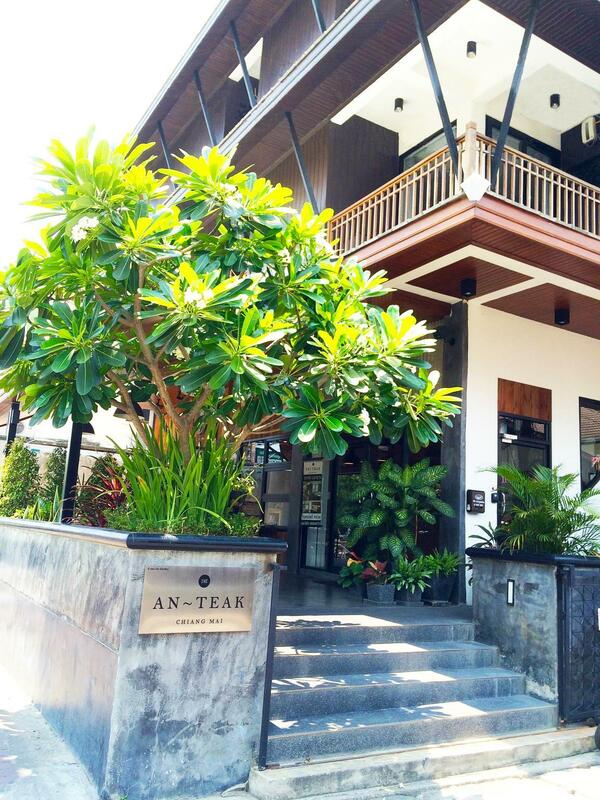 Al visitar Chiang Mai, vosté es sentirà com a casa a The An Teak Chiang Mai Hotel, què li ofereix un allotjament de qualitat i un gran servei. A només 10.1 km, aquest hotel de 3-estrelles és fàcilment accessible des de l'aeroport. Amb la seva bona localització, l'hotel ofereix fàcil accès a les destinacions obligades de la ciutat. El The An Teak Chiang Mai Hotel, s'esforça al màxim per tal que els seus hostes es tribin còmodes. Per tal d'assolir això, l'hotel compta amb els millors serveis i instal.lacions. A l'hotel s'hi pot gaudir d'unes comoditats de primera classe com Wi-Fi gratuït en totes les habitacions, servei de neteja diari, Zones públiques amb Wi-Fi, servei d'habitacions, restaurant. Entri en una de les 12 habitacions i escapi de l'estrès del dia amb una ampla gama de comoditats com televisió de pantalla plana, penjador de roba, armari amb clau, mirall, tovalloles. A més, l'oci que l'hotel ofereix assegurarà que tengui molt a fer durant el dia. 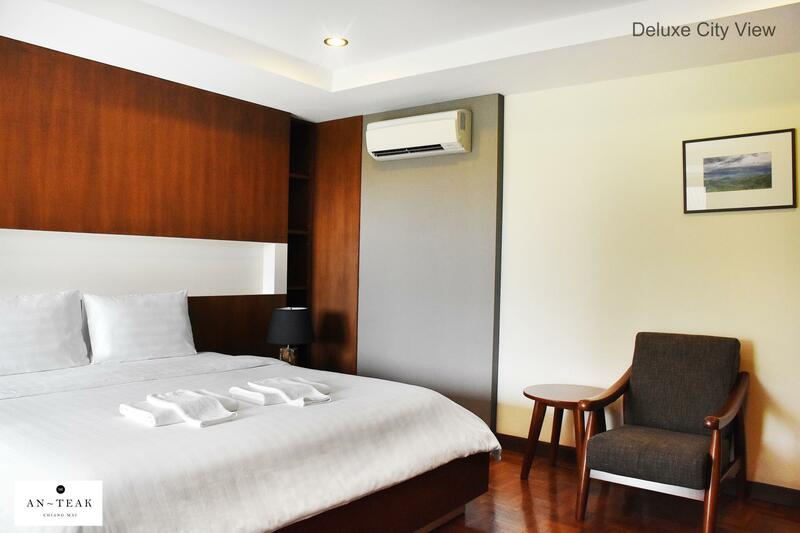 The An Teak Chiang Mai Hotel és un lloc ideal d'estada pels viatgers que busquin encant, comfort i facilitat a Chiang Mai. L'edat mínima dels hostes és 12 anys. We had a very clean room with well thought out furnishings .location was less noisy than we feared. Stairs are steeply pitched and were a problem for my wife who has knee issues. Very willing magement. Great location, near the Sunday market which is excellent. Also, say hi to Dang the hotel dog (a rescue). He is the sweetest! Note that there are no lifts in the building. Really enjoyed the hospitality. Felt like home. A smiling and always willing to help host was really important factor to make our stay in Chiang Mai really special. It was a nice touch of great service to agree to take care of our huge backpack, while we were exploring Chiang Dao and Chiang Rai for 3 nights. Stay here and you’ll love it. 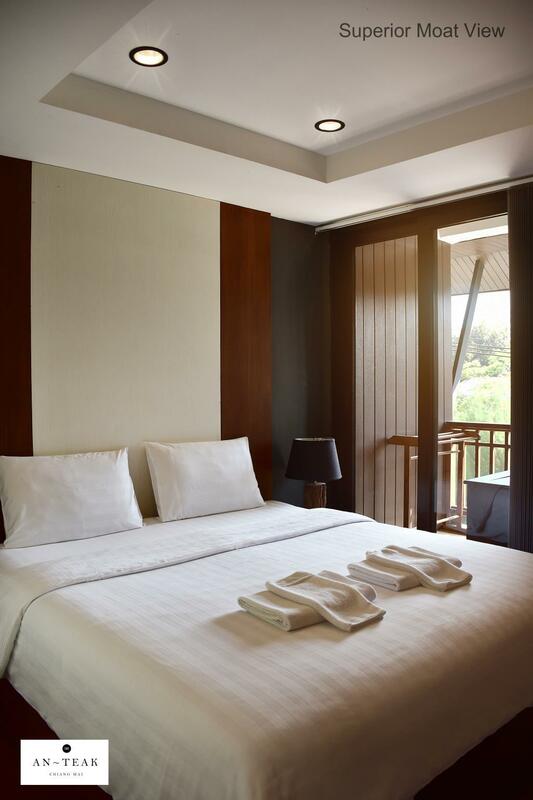 The An Teak Chiang Mai Hotel was located perfectly for my discovery of the city and its surroundings. The owners are very friendly and helpful. My room was very clean and the bed super comfy. The only downside was that it was facing the main street and therefore pretty noisy- so bring earplugs. Also I’d encourage everyone to try the cafe downstairs. Their shakes are delicious. We couldn’t have picked a better hotel than this during our stay in Chiang Mai. Between the service received and location, we were very pleased with the hotel. It had all the amenities we needed, and was walking distance to plenty of food, sites, and had a view of the Old City moat. Will definitely stay here again when we return to Chiang Mai. Stayed at a room right by the road, and it was SO noisy from cars and motorcycles day and night. But the worst thing was the smell from the bathroom. The location is great, the reception is so welcoming and kind, and the bed is huge and room is spacious. But hey, I won't come back where I have to breathe with my mouth whenever I try to use the bathroom really. 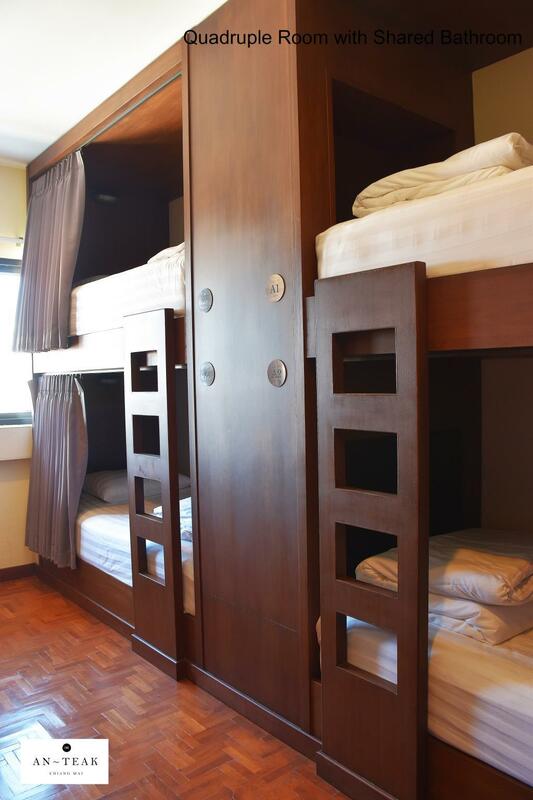 + clean and spacious room with nice amenities 깨끗하고 여유있는 방에 각종 세면 도구부터 면봉까지 깔끔하게 잘 갖춰져 있어요. + great towels and beddings, slept like a baby for 4 nights 네 밤 잤는데 침대랑 침구 너무 좋아서 완전 꿀잠잤어요. + 3 min walk to the Tha Phae Gate & Sunday Market 타패게이트(선데이 마켓)에서 큰 길 따라 걸어 3분 내로 이동 가능해요. + windows have locks and extra chain lock inside the door made me feel safe 문 안쪽에서 완전 튼튼한 체인 걸어 잠글 수 있어서 안심했고, 발코니 창에도 잠금장치되어 있어요. + kind and helpful owners with fluent English 사장님 부부 정말 친절하시고 영어도 잘하세요. + right next to the street but still quiet at night, sometimes almost scary, haha 큰 길에 있는데도 밤에 너무 조용해서 첫 날엔 다른 손님도 없나 싶어 약간 무서웠어요.ㅋㅋ + nice all-day breakfast place in the same building 1층 깔끔한 카페에서 하루종일 브런치 메뉴나 음료 맛있게 드실 수 있어요. - I didn't check if they have laundry service or not, anyway, having coin laundry machines in the building would be nice? 세탁서비스 있는지는 안 물어봐서 모르겠네요. 동네 곳곳에 빨래방이 있어 이용해봤는데 땡볕에 빨랫감 들고 다니는 거 좀 귀찮았어요. the host was kind and nice and pretty. the location is perfect. it's located in the middle of the old city area. very close to the tapagate. but you better go to the other massage shop not the one next to the hotel. So glad I stayed here for three nights. Really friendly check-in starts things off right. The room is comfy, well-decorated and the location excellent. I really can't think of even a minor thing to complain about. But if I had to...hmm...the bar of soap was on the small side....haha. Thanks for a great stay! I LOVED my stay at the An Teak Chiang Mai Hotel. 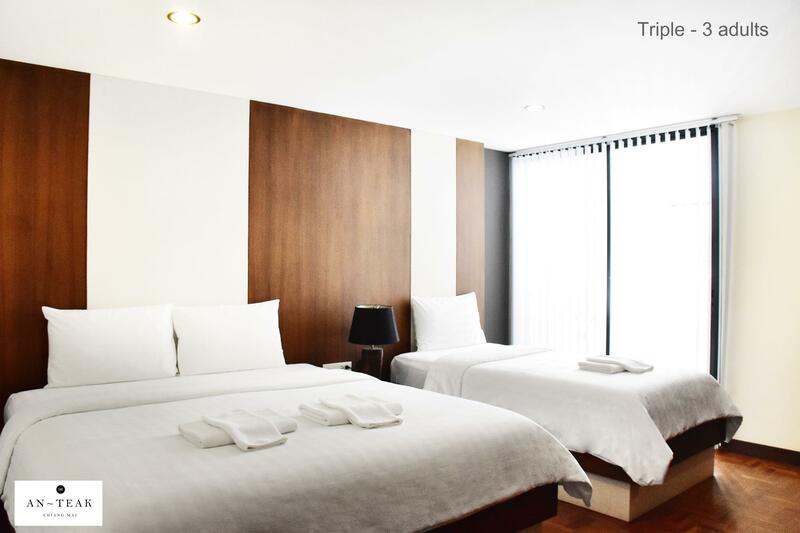 It is located right next to the Ta Phae gate in a perfect location. There is a great cafe at the bottom of the next door building that was perfect for breakfast in the mornings. The staff was incredibly helpful with providing advice and helping with booking activities during my stay. I stayed over New Years holiday and there was a really fun lantern festival and walking market to celebrate within 2 blocks of this hotel. When I come back to Chiang Mai, I will stay here again. I won't stay in the Nimman area again after I found this place. Super convenient location. The city centre and famous markets are within a walking distance. The owners were very welcoming and helpful. I got a moat view room and found it a bit noisy at night. Anyway, the room was clean and comfortable. Located on the eastern border of the old city, this hotel is perfect for anything you want to do. Because it's located in the old city, there are plenty of temples to see. And because it is on the eastern side, it is a short walk to the night bazaar and the river. The staff was also extremely pleasant and helpful. The day before check-in they let us drop our bags off before we went to Pai (we stayed a night in Pai). 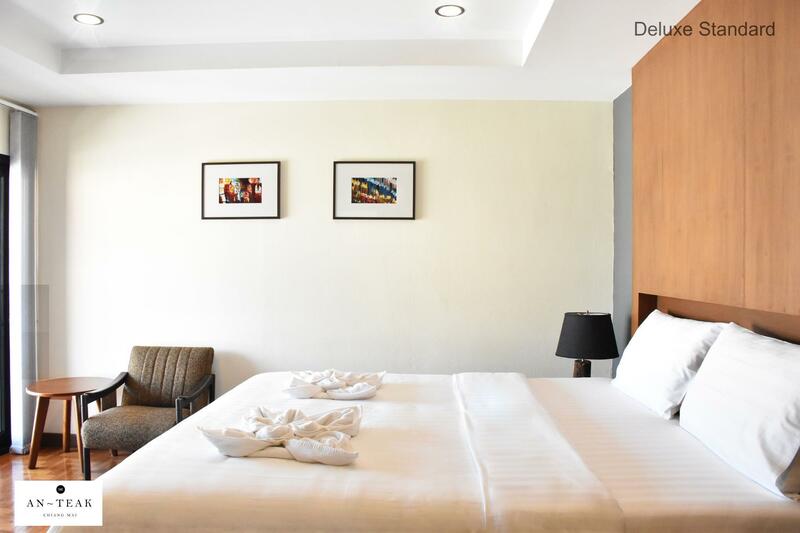 Great hotel in the heart of the Chiang Mai, close enough to walk to all the major attractions in the old city. We cannot wait to comeback and stay again as their is so much more to see and do, and will definitely choose An Teak again. Thankyou for all your friendly advise and assistance. Awesome for the money, perfectly located. A little loud because on the main road, but didn't bother me! The hotel is clean, modern and comfortable. The owner is very helpful with advice and recommendations around Chiang Mai. Its location near the Tha Pae Gate is very convienent to many different restaurants, markets and places for relaxation and entertainment. I will stay here again during future visits to Chiang Mai.